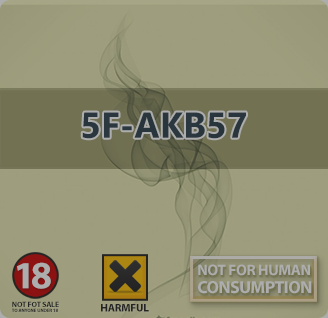 5F-AKB57 is a synthetic designer cannabinoid that acts as a potent agonist for the CB1 and CB2 cannabinoid receptors. It produces subjective effects somewhat similar to that of cannabis with a short duration and an emphasis on intense physical sensations. However, its metabolism has been described in the scientific literature. It was first identified in South Korea and is available for sale as a grey area research chemical through online vendors. Cannabinoids are commonly smoked or vaporized to achieve a quick onset of effects and rapid offset. Also, 5F-AKB57 is orally active when dissolved in a lipid, which can increase the duration significantly. Like other cannabinoids, it is insoluble in water but dissolves in ethanol and lipids. Unlike cannabis, the chronic abuse of synthetic cannabinoids has been associated with multiple serious injuries deaths and more dangerous side effects and toxicity in general. Therefore, 5F-AKB57 strongly discouraged to take this substance for extended periods of time or in excessive doses.